Brand: Richard Mille Dial Color: Skeleton Series: Richard Mille Bracelet/Strap: Rubber Model Number: RM030 or RM30 Clasp Type: N/A Gender: Mens Movement: Self-Winding Size: Extra-Large Power Reserve: 55 hours Case Material: Titanium Water Resistance: 50 meters/165 feet Case Dimensions: 50mm length x 42.7mm width Warranty: The Finest Watches Three-Year Warranty Case Thickness: 13.95mm Limited Edition: N/A Crystal: - Special Features: Power reserve indicator, winding indicator - See more at: http://www.thefinestwatches.com/richard-mille-automatic-declutchable-rotor-titanium-watch-rm30-p-131-20864.html#sthash.xGv8Fn7P.dpuf Richard Mille Automatic Declutchable Rotor Watch, tonneau-shaped titanium case (50mm length x 42.7mm width x 13.95mm thickness) with transparent caseback, 12 titanium spline screws hold together the case for better control of torque during assembly, skeletonized dial with white Arabic numerals, vertical date indicator at 7 o'clock, winding indicator at 12 o'clock, 40 jewel calibre #RMAR1 self-winding movement with adjustable rotor geometry, 55 hour power reserve, scratch resistant sapphire crystal, water resistant to 50 meters. 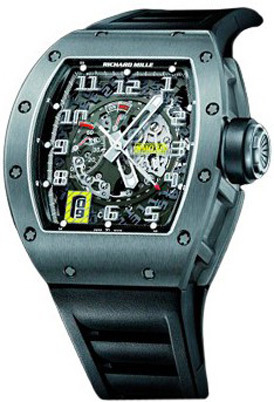 Есть вопросы по Richard Mille Automatic with Declutchable Rotor RM 030. ДОСТАВКА 5-7 ДНЕЙ! ?